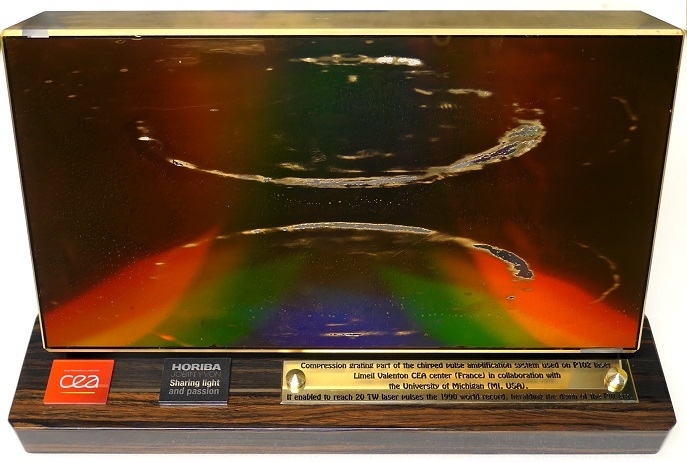 HORIBA, Ltd. (Head Office: Kyoto, Japan; hereinafter, “HORIBA”) is pleased to announce that a diffraction grating developed by its Group company, HORIBA France SAS, has been added to the collection of the Nobel Museum in Stockholm, Sweden. 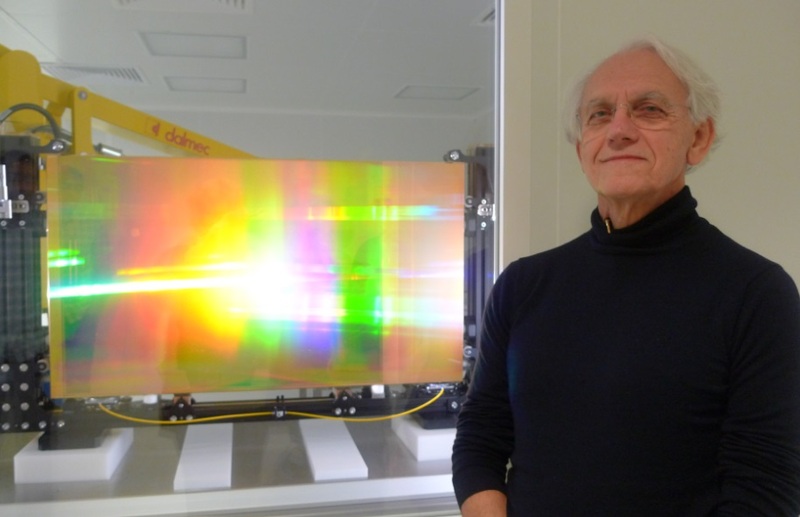 A laureate of the 2018 Nobel Prize in Physics, Professor Gérard Albert Mourou has long used HORIBA’s diffraction grating for his research to improve laser performance, which has resulted in significant achievements. When asked to offer an item for exhibition at the Nobel Museum to commemorate his receipt of the prestigious award, Professor Mourou was kind enough to choose the diffraction grating used in his laboratory. HORIBA is highly honored to have its product exhibited at the Nobel Museum and has renewed its determination to be of service to researchers the world over for the continued progress and development of science. In the 1980s, research on a technique for radiating extra-high-output lasers within a very short time became widespread. The technique which made the practical application of this concept possible was chirped pulse amplification*1 (CPA), for which Professor Mourou was awarded the Nobel Prize. Published by Professor Mourou in 1985, CPA is a technique for stretching out an ultrashort laser pulse*2 using a diffraction grating. After the laser pulse is amplified by an optical amplifier, the pulse width is compressed using a diffraction grating again. Diffraction gratings at the time were not able to withstand strong radiant fluxes and amplifiers were liable to break when irradiated with strong luminous fluxes. To overcome these challenges, Jobin Yvon SAS (a HORIBA Group company, now HORIBA France SAS) worked to enhance the durability of diffraction gratings against luminous fluxes. In the 1990s, thanks to an improved diffraction grating by HORIBA France, it became possible to increase the laser strength by 1,000 times. Pulsed lasers may be used for pinpoint radiation without affecting surrounding tissues. This property has popularized eye and corneal refractive surgery using femtosecond lasers*3. Minimizing risk in ophthalmic operations, this technique has corrected the vision of several million people. High-intensity lasers are used for proton beam therapy, which accelerates protons to several hundred MeV*4 to allow them to pass through tissue, as well as radioactive nuclides for tumor therapy. High-intensity laser radiation can significantly shorten the life of long-life atoms and achieve stable nuclear transformation, thus enabling long-term storage of radioactive waste. Located in Gamla Stan, the Old Town in Sweden’s capital Stockholm, the Nobel Museum showcases the history of the Nobel Prize and Nobel laureates, as well as information on the founder of the prize, Alfred Nobel. To commemorate the 100th anniversary of the Nobel Prize, this museum opened in the spring of 2001 by renovating part of the former stock exchange building, which the Swedish Academy is a tenant of. Every year, Nobel laureates present artifacts for permanent display at the museum; and, starting around 2001, they sign the underside of chairs in the museum café. Boasting 200 years of history since its foundation in 1819, HORIBA Jobin Yvon SAS (now HORIBA France SAS) supplies optical analyzers such as Raman spectroscopic analyzers and X-ray fluorescence analyzers to its customers in the cutting-edge scientific and technological fields. They also enjoy high penetration in specialized fields, which include research and development institutions and universities in various countries. In particular, their technology’s reliability is proved by the fact that NASA and other state-of-the-art research institutions around the world use their diffraction gratings and spectrometers.